If you haven’t heard of Foxen yet, this weekend is your chance. 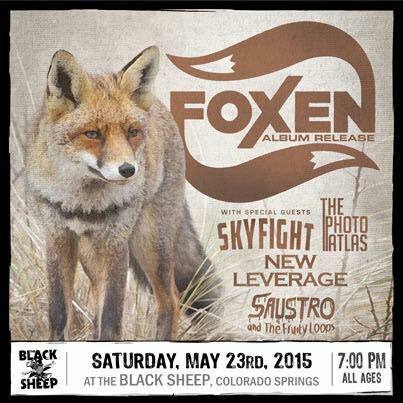 A local rock band trio dedicated to keeping “Rock n’ Roll alive in the 21st Century”, Foxen will be releasing their first self-titled album, Foxen, this weekend, proceeded by special guests SkyFight, The Photo Atlas, New Leverage, and Saustro and the Fruity Loops. The band consists of three members- Todd Gilles; Guitar and Vocals, Eric Kruse; Drums and Vocals, and Jenny Contreras; Bass and Vocals. I had the pleasure of seeing Foxen last August at the Black Sheep when they opened for The Griswolds, and am excited that they have continued to move forward and completed their first album, which I got to preview this week. Make sure you catch “Rabbit” and “Strongface”, my personal favorites on this first album. I got to chat a little bit with Foxen frontman, Todd Gilles, on the band beginnings and how they’ve gotten to be where they are now. So, how did the band actually come to fruition? Todd: Eric [Kruse] and I have known each other since 2009 ever since meeting at the Maté Factor in Manitou Springs. He and I had always talked about collaborating musically since then but we never fully committed to it until last February when we found an ad on craigslist for rehearsal spaces and decided to get one. After that, things just clicked, and before we knew it, another band had heard us playing through our door and asked us to play a show with them. So we played our first show May 30, 2014. Foxen is a bit of a unique name. How did you come up with it? T: Well, as far as a name goes, I have always loved foxes ever since I found out that Todd means Fox in old English (and saw the Fox and the Hound when I was little). Eric and I have always been big Brian Regan fans and we loved his joke about how he was the dumb kid in class who would get called on after the smart kid would answer a question. The teacher would ask the smart kid, “what’s the plural of ox?” and he’d say, “Oxen!” and then she’d call on him and say, ” Brian, whats the plural of box?” and he’d say, “uhhhhh, Boxen?” So we were like lets make Fox plural this same way! And it’s the name that stuck. *Side note- I Love Brian Regan! Bonus points for that one. When did Jenny Contreras (Bass and Vocals) join Foxen? T: Eric and I initially started Foxen as a two piece and quickly realized that we were writing songs that needed that low end that I couldn’t fill on my guitar so one of our oldest friends, Lauren Vieira, joined us on bass for four shows and played bass on our new EP before leaving the band to focus on her main band, Dreadnought. We met Jenny Contreras, our bassist now, because she was a friend of a friend who we met at some of our shows. We all started hanging out just as Lauren decided to leave and we just slotted Jenny right in there after finding out she played guitar. She now has six shows under her belt with us this year already. Your band is centered in Colorado Springs, but where are you all from? T: I’m from Rockford, IL., home of Cheap Trick! But I moved to Colorado Springs to train for ice dancing in 2001. So I’ve been here a long time. Part of the reason Eric and I didn’t start Foxen earlier is because I moved to Michigan for about 6 months two separate times to skate and train for international competitions there. Now I’m retired and I just coach skate. Jenny moved here from Texas because her Dad was in the military, but she’s been here since before high school. So she’s almost a native. Eric has lived here pretty much his whole life. He used to drum for Denver’s Elite Blue Knight Percussion Ensemble and now has helped found his own Elite Ensemble called Altitude Percussion here in the Springs. He also teaches percussion for Pine Creek High School, and writes music for the Air Force Academy Band and various other high schools in Colorado. Seems like you all have quite a few talents aside from playing music! So what’s coming up next for you guys after this album release show? T: We have a few future shows booked. We are playing the 24th at the Zodiac and then the next one we have booked is June 20th at CK Comics in Manitou Springs. We are trying to finalize a few mini tours to Wyoming and Nebraska later this summer but those are the only two shows fully confirmed.